"My wife and I were traveling to Arizona along the back roads of Utah and came upon the most extraordinary scene. Out in the middle of nowhere in one of the most desolate stretches of Arizona desert, near the Utah border, we discovered an abandoned rock house built into an overhanging bolder. The surrounding area was strewn with huge oddly shaped rocks and the cliffs behind the house were wreathed in clouds-stunning! We were captivated! I took 50 or so photos form every angle. I definitely wanted to paint this scene! I decided on a small piece and did very tight detail work to capture the textures and colors. There was nothing alive in the area except some brownish bushes here and there. I decided the piece needed some life in it, so I experimented with various creatures, snakes, lizards even gila monsters. Nothing seemed to fit. Since I wanted to sell the image I also decided that whatever "life form" I added must be not only indigenous but also not-too-yucky to hang in someone's house. Since snakes, lizards and such are kind of yucky, I had to come up with something else. My niece and I were bouncing ideas around and she mentioned a bird shadow and it immediately clicked with me. No actual living creature, just the shadow of a predator! Edgy but not yucky - rich with symbolism-perfect for my painting. 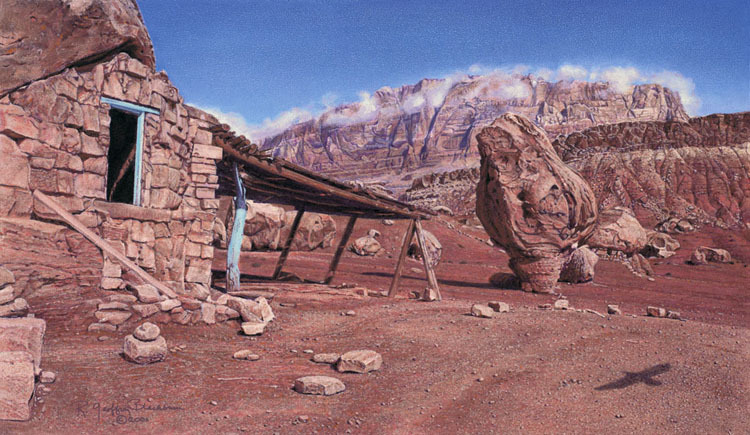 In 2010, I created a companion piece to "Desert Rules" entitled "What's Left" which expands the view of the Rock House and surrounding area." © 1970-2017 R. Geoffrey Blackburn ALL RIGHTS RESERVED.